Vince Young made his pro debut with the Tennessee Titans against Reggie Bush and the New Orleans Saints on Saturday. He gained 28 yards on four runs including three first downs. He completed four passes for 56 yards and threw a beautiful 83-yard pinpoint pass that was dropped by Roydell Williams. 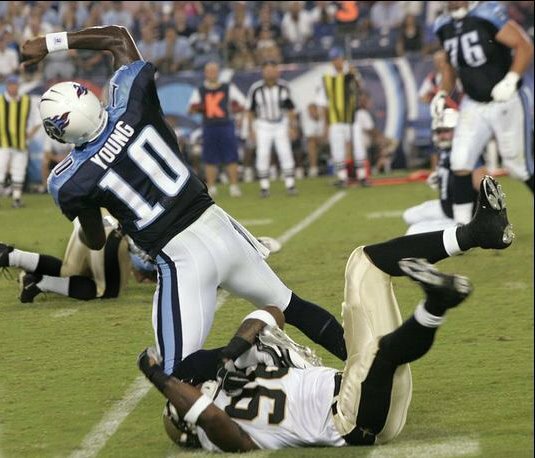 Reggie Bush also had some highlights in his pro-debut, but as far as I'm concerned the second most interesting thing about the game was when T-Rac, the Titans oversized raccoon-like mascot, ran over Saints backup quarterback Adrian McPherson with a golf cart. Now I know that any injury is terrible, but McPherson really had it coming. T-Rac caught him looking at his nuts. While Vince ended the night without getting tackled by any muppets, he did send a wave of panic through the land when he went down with an ankle injury after a crocodile tackle by DL Javon Nanton. The injury isn't serious and he's not expected to miss any practice. Then again even serious ankle injuries aren't serious for Vince. The last video clip is from Young's freshman year at Texas when he came in off the bench in a tight game against Kansas State. He played well but sustained the nastiest looking ankle sprain late in the third quarter. Kansas State then scored to take the lead but through sheer force-of-will, Vince Young miraculously recovered and led the Longhorns to a tough victory and become the heart and soul of the team for the next three years. I know that might sound a little over-dramatized, but just watch the clip. Titans/Saints Game Highlights & VY Injury Report. Watch Mack Brown on The Best Damn Sports Show. or even the casual Longhorn fan.